I make a lot of rice here at the Common Housefly Test Kitchen. I use the common method of bringing the rice to a boil and then turning the heat down and letting it simmer, covered, for a specific period of time. This is called the Absorption Method and it the way most of us Westerners cook our rice. I will admit, that most of the time our rice is sticky and clumpy - not the fluffy stuff that I envision when we put the pot on the stove. More mushy than fluffy. Maybe you have the same experience. I have been using too much water. I was taught to use a 2:1 ratio of water to rice. So if I am making 1 cup of rice I would cook it in 2 cups of water. If I am making 2 cups of rice I would use 4 cups of water. I have recently discovered the correct ratio is 1:1, plus 1/2 cup of water. So, now, if I am making 1 cup of rice I use 1 1/2 cups of water. If I am making 2 cups of rice I use 2 1/2 cups of water. And so on. I have found this works with both white rice and brown rice. The rice cooks perfectly, resulting in fluffy rice with clearly articulated grains. Yes - I rinse my rice. You can skip this step if you want to, but it is worth the few minutes it takes to do. 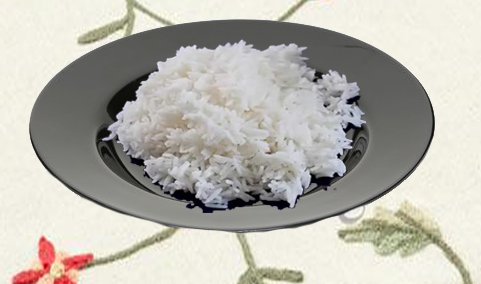 Measure your rice into a bowl and rinse it in cold water. Drain and repeat until the water runs clear. Put the rice in a pot with the water and a pinch of salt. Bring to a boil. Use a 1:1 ration of water to rice, plus 1/2 cup of water. Turn the heat down to a simmer and cover the pot. Cook 20 minutes for white rice, 45 minutes for brown rice. Let the rice steam for 10-20 minutes after the cooking time is up. Leave the pot on the burner with the heat off and the lid on. 7-plies of Handcrafted American-made Goodness!